What's It Really Like To Travel On A Private Jet? Why private jet travel in the first place? If you’re wealthy, why not just buy a jet? The reasons against owning your own plane are many, but the most important one is cost. According to Aviation Today, the average bankroll for a jet owner is $1.5 billion. The price of a small passenger jet can range anywhere from a paltry $3 million to a staggering $90 million, or more. But while the purchase price may be a ‘one-off’ cost, you also have to consider where you will base your jet, the crew, fuel and costs to fly it and, of course, keep up with the mandatory maintenance requirements. When you add those costs up, even the very well-off just can’t afford to own a personal jet. However, there is an excellent alternative: Rent one. Renting is a much less costlier outlay, but has similar, if not identical, outcome. You get to travel wherever and whenever you want in luxury. It’s convenient, safe, and you avoid the scanners, pat downs, immigration lines, and crowds at large airports. In Singapore, the demand for private hire outgoing flights isn’t high, according to Ms. Alex Khalil, who is the commercial manager for Executive Jets Asia Group. According to her, “The super rich here take first class on a Singapore Airlines flight. Singapore is a major aviation hub and SIA serves a wide range of regional and international destinations.” She also revealed that the core business of her company it that of “private medical emergency evacuations”. They rarely do private jet charters. However, it seems that incoming personal aviation flights to the tiny Republic are quite routine. For instance, it’s estimated that over 100 private jets, from jumbo 747s to small Learjets, flew into Singapore for the USA-North Korea summit. Most of these planes landed at either the Paya Lebar military airport or the private Seletar airport. Very few landed at Changi International Airport so as to avoid contact with the general public. Who are the people that fly on private jets? Figures reveal that almost 20 percent of those who use private aviation work in finance and banking. 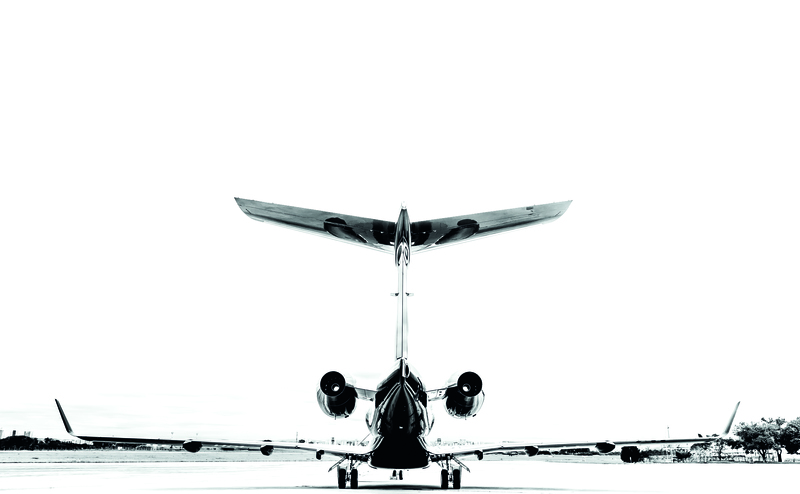 Other concerns that fly private often include real estate firms, industrial giants, and technology entities. And if you put it down to gender, only one in ten private jet customers are likely to be female. But why even use a private jet in the first place? If, as Alex Khalil suggests, first class commercial travel already offers all the luxury you might ever want at a fraction of the cost, then why bother with private aircraft? The answer is simple — it maximizes time, according to The Jet Traveler Report 2018, which polled the super-rich as to why they hired private jets. It is surprising, but comparisons between first-class travel and private jets reveal that the first-class option is cheaper and sometimes more luxurious. After all, an A380 has loads of space, offers incredible galley-made gastronomic meals, an extensive wine list, and on some flights, even showers. A small Learjet doesn’t even approach that level of luxury. Small jets are cramped, have limited menus, and can’t carry that much luggage, let alone offer showers. So why not travel first class? Survey shows that it’s because Ultra-High Net Worth Individuals, those with more than $30 million in assets, don’t like waiting around and like to fly on short notice. What’s more, smaller jets can fly into less-crowded, regional airfields where clearance is often faster and the ultimate destination closer; and it tends to be more private. With a private jet, meetings that run over are no problem; the plane will wait. So convenience plays a big role how the ultra-rich travel. They would also like to maintain control of their lifestyle. Many of the super-wealthy don't view private jet travel as a luxury, and rarely even drink the champagne. According to an industry insider, one private jet customer would only book the flight if the company could guarantee that they could serve Big Macs and French fries during the flight. So much for gourmet meals. Another important consideration to many travelers who fly on private jets is security in terms of the plane’s age and airworthiness. There is also the fact that they won’t be carrying other people’s luggage, which might have dangerous items in it. A private jet also allows individuals to fly without being easily recognized. Many well-known executives can travel in relative secrecy – a big plus if you’re negotiating a contract or selling a company. But while there are some who just like Big Macs, there are others who want all that a private jet can offer. Take the private airline Crystal Skye, for example. It has the world’s largest private charter jet – a converted Boeing 777 that usually accommodates 300, but on this pleasure vessel there are just 88 passenger seats. Crystal Skye says that it’s £43,000 an hour charter fee that will provide experiences unlike anything else in the sky. The forward section of the 777 has a comfortable bar, 24-seat restaurant, and lounge that would make most ground based establishments look like poor cousins. In the aft section of the jet, there is an up-to-date gourmet galley and a 200-bottle wine cellar that is reported to be the largest in the air. “The galley is incredible,” remarked Mr. Jon Jurgens a former chef. He was impressed at the equipment provided on this stellar aircraft. They include blenders, ovens, fryers, frothers, steamers, and even a sous-vide slow cooker. “They can grill steaks, poach fish, and churn ice cream even at 42,000 feet,” he explained. Skye’s flying restaurants are sure to please even the most finicky of fliers. But suppose you’re not satisfied with just a souped-up Boeing 777? Rumors on the web abound that one mega-rich Sheik from Saudi Arabia recently purchased an Airbus A380 for his personal travel. 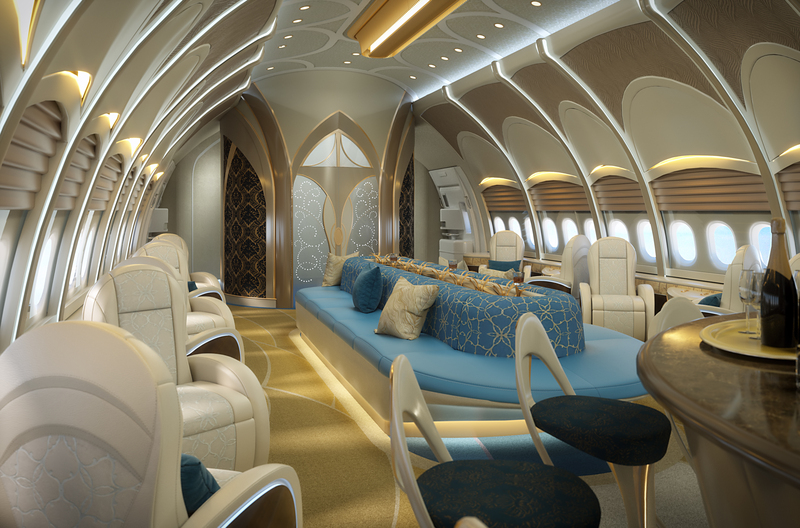 One of the provisos was that the firm selling the plane could customize the cabin interior to the Sheik’s high standards. Besides the bars, bathrooms, bathtubs, wine cellar, and eateries, the oil-rich Arab also requested that the plane be outfitted with a small swimming pool. With private jet travel, it really does seem that the sky is the limit.